ArtsBuild is seeking candidates for the 2018 Holmberg Arts Leadership Institute, an eight-part series designed to fully engage participants in the arts community. The deadline for applications is Aug. 17. Launched in 2005 in memory of long-time board member and arts advocate A. William Holmberg, Jr., the Institute offers behind-the-scenes site visits to cultural and educational institutions, case studies of arts agencies, panel discussions with community leaders and a forum for pursuing shared goals among arts leaders, business leaders, educators and philanthropic foundations. 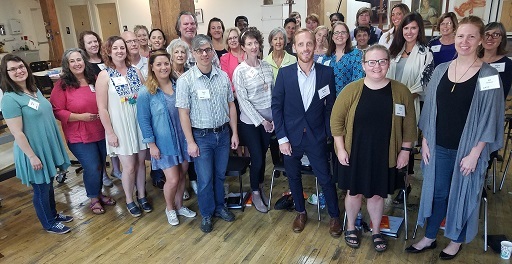 “A colleague encouraged me to apply for the Holmberg Arts Leadership Institute program early in my career as a way to get plugged into Chattanooga’s leadership culture,” said Stratton Tingle, Holmberg Institute graduate and executive director of SoundCorps. Participants will receive a copy of Daniel Pink’s book, “A Whole New Mind,” a "critically acclaimed examination of the six essential aptitudes on which professional success and personal fulfillment now depend." Participation is open to residents of the greater Chattanooga area who have demonstrated passionate support and advocacy for the arts and who have made a commitment to making a difference in the quality of life in the community. Past Institute graduates have gone on to serve on boards of directors and in other leadership positions with ArtsBuild and other cultural agencies. With keynote speakers and panelists drawn from the community’s leaders, classes will take place from 8:30 a.m.-noon on the following days: Sept. 11, Sept. 28, Sept. 25, Oct. 2, Oct. 16 (all-day trip to Nashville), Oct. 23, and Oct. 30. A welcome reception will be held on Sept. 10 at 5:30 p.m. and a graduation program and reception will take place on Thursday, Nov. 1 at 5:30 p.m.
A maximum of 30 people are selected to participate in the Institute each year. Tuition is $300, with limited scholarships available. Applications are available online at https://artsbuild.gosmart.org and must be submitted with a letter of recommendation by Friday, Aug. 17. For more information, contact ArtsBuild at 423-756-2787.